The Overlook Cabin’s architecture is the creative effort of Chas Architects from Austin, Texas. 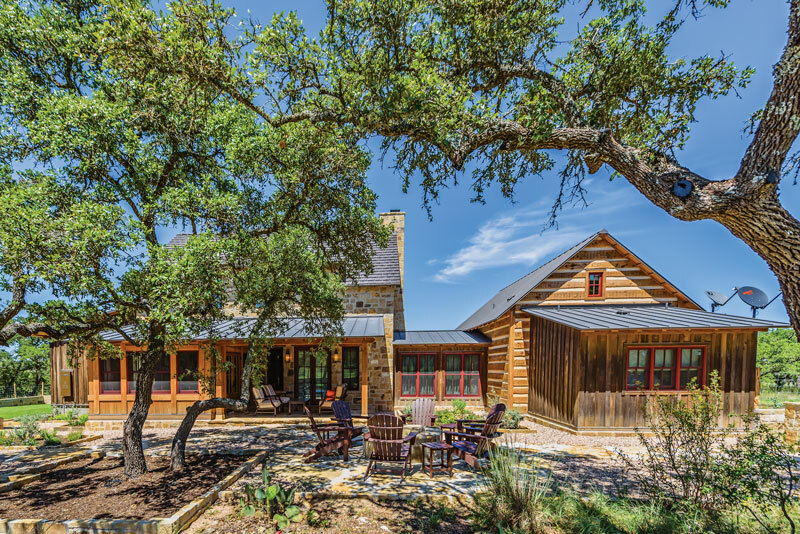 Blending traditional Texas stone and German log construction is common in the Hill Country. Between the stone and hewn logs is brushed-cypress board and batten. 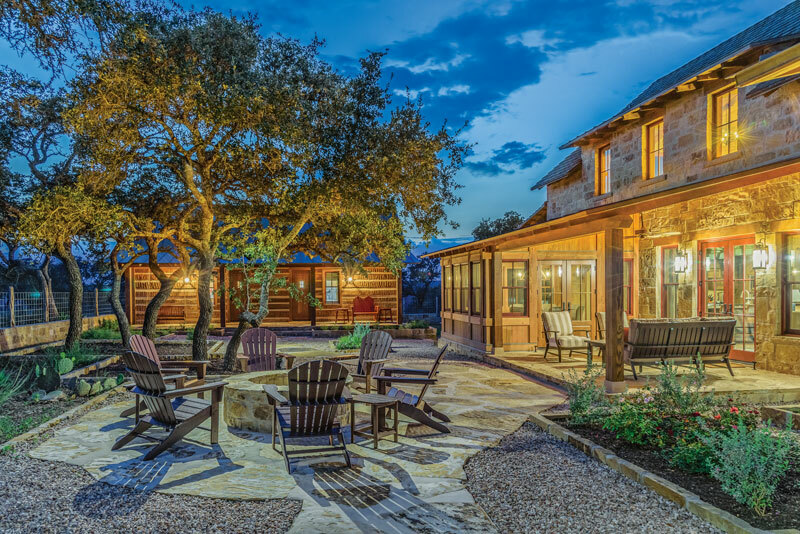 Deep in the heart of Texas Hill Country, amid a lush, rolling background and the historic charm and German heritage of Fredericksburg, lies Boot Ranch, where private estates enjoy sweeping and spectacular views of the meticulously manicured yet rugged grounds that surround them. The main cottage’s great room is where the whole family truly comes together. Comfy kick-up-your-feet furnishings pull in the colors of the structure, from the alder kitchen cabinetry to the reclaimed oak to the pale-cream of the Oklahoma Blend stone. All the rich textures are softened by drywall painted in a very light beige. And by combining pendant lights with table lamps and chandeliers to augment the extensive natural light, the 525-square-foot room feels bright and spacious. For the kitchen, Austin-based interior designer Donna Figg chose engineered random-width hickory flooring that was hand-scraped and wire brushed. Engineered hardwood allowed them to glue it directly to the concrete-slab foundation that is common in Texas. 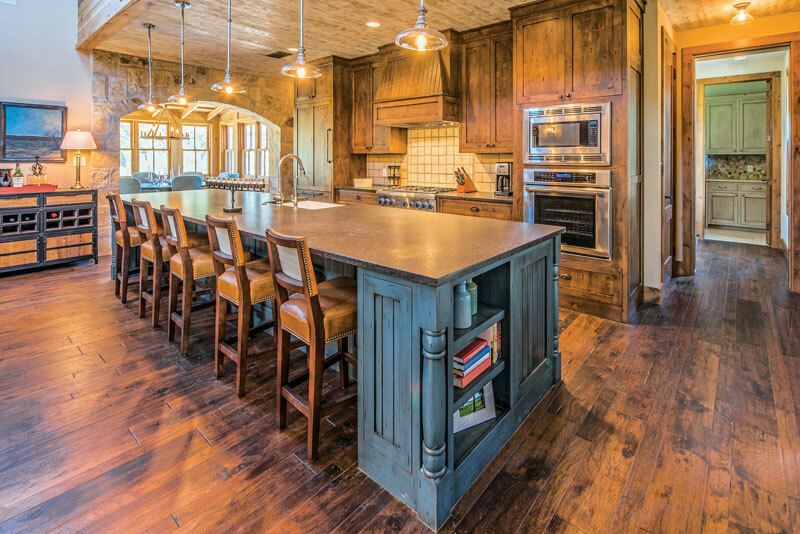 The alder-wood cabinetry was custom built on site and lightly distressed. The island was painted a grayish-blue with a glazing technique and topped with absolute “Black Pearl” granite with a leathered finish, which gives it a rich honed texture rather than one that’s highly polished. A huge pantry is located directly behind the kitchen and leads to the utility room. 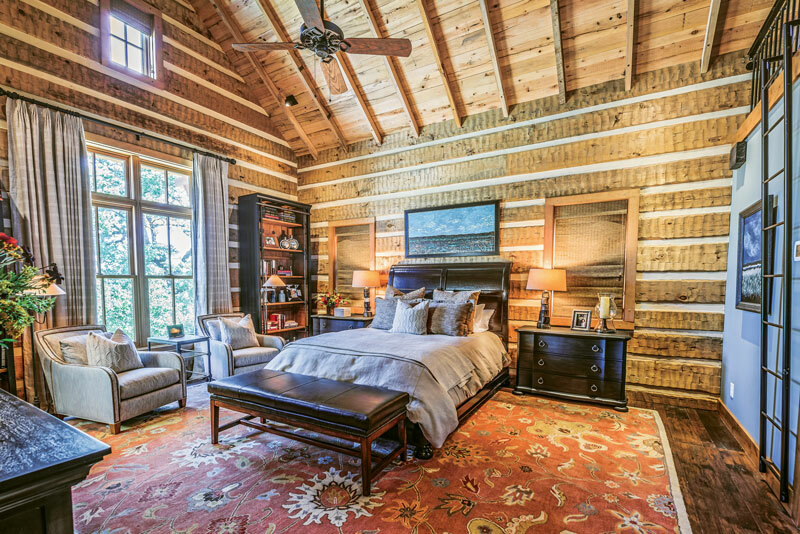 In 2015, the Wilson Family enlisted Chas Architects, local builder Centurion Custom Homes, interior designer Donna Figg and Newport, Tennessee-based log home producer Hearthstone, Inc. to craft a singular residence that would harmonize with the property and give the impression that the place grew over time and generations. 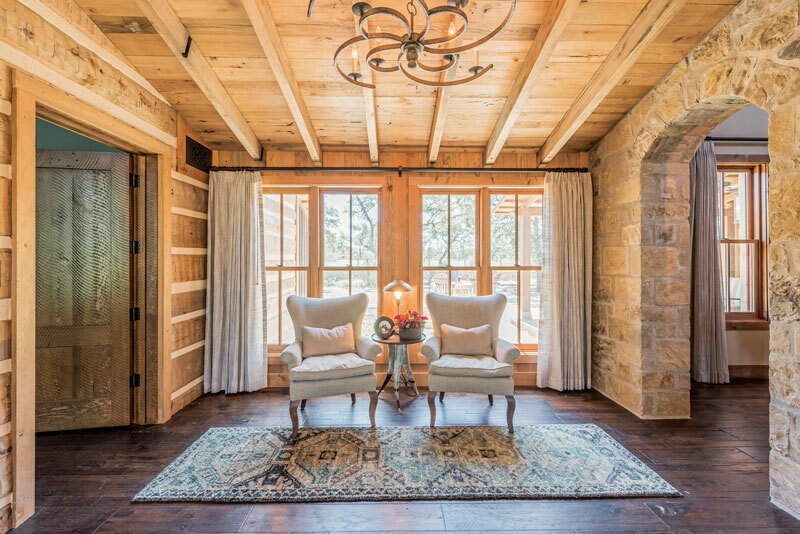 To connect the log portion of the main house with its stone-encased counterpart, the owners incorporated this “music room.” It provides a transition between the main cabin and the master suite. This sunny space is brightened by floor-to-ceiling windows and the reflective quality of the ceiling’s antique oak beams and random-width decking in a natural finish. 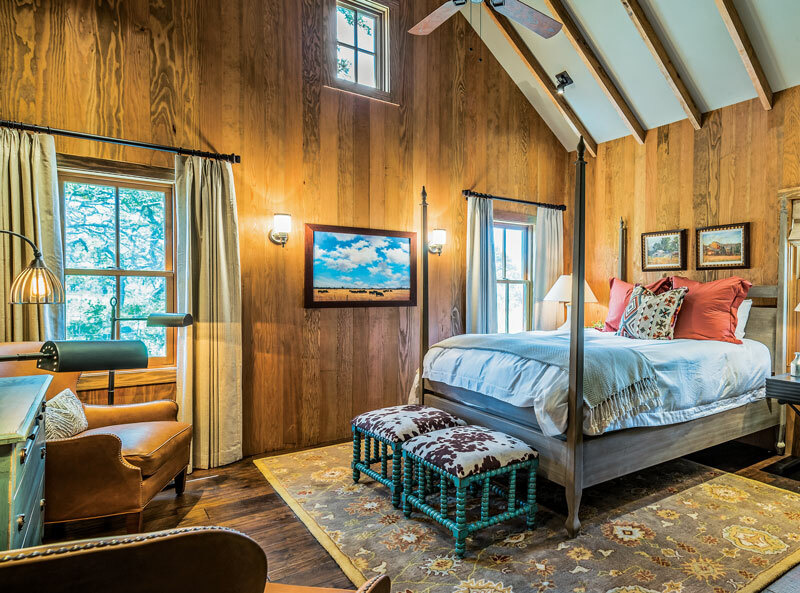 This 17-by-30-foot master bedroom in the main cottage has random width, kiln dried hand-hewn and distressed eastern white pine log siding on the interior and exterior. Log provider Hearthstone, Inc. mixed 8-, 10- and 12-inch widths for character and old-time authenticity. 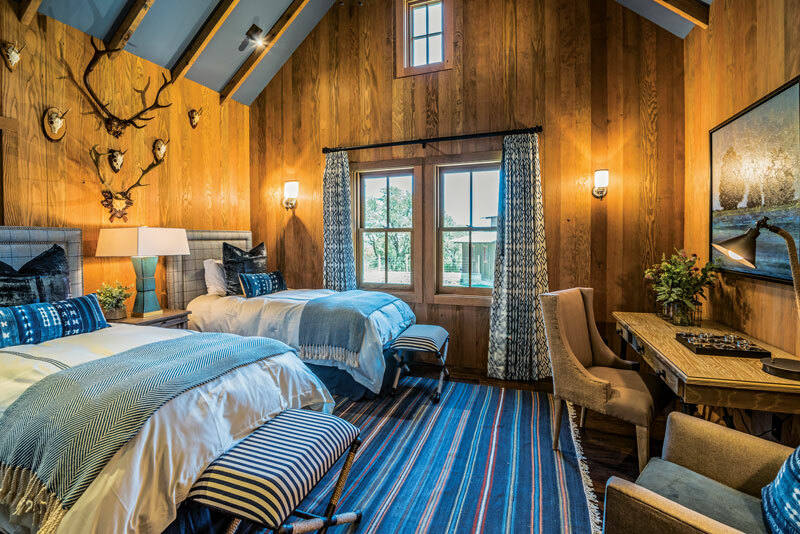 At the ridge, the room’s ceiling soars 17 feet off the floor, giving the space a heavy helping of grandeur, and is encased in antique oak rafters and random-width decking in the same material. The small display loft, accessible by an iron library ladder, is positioned above the master bath. 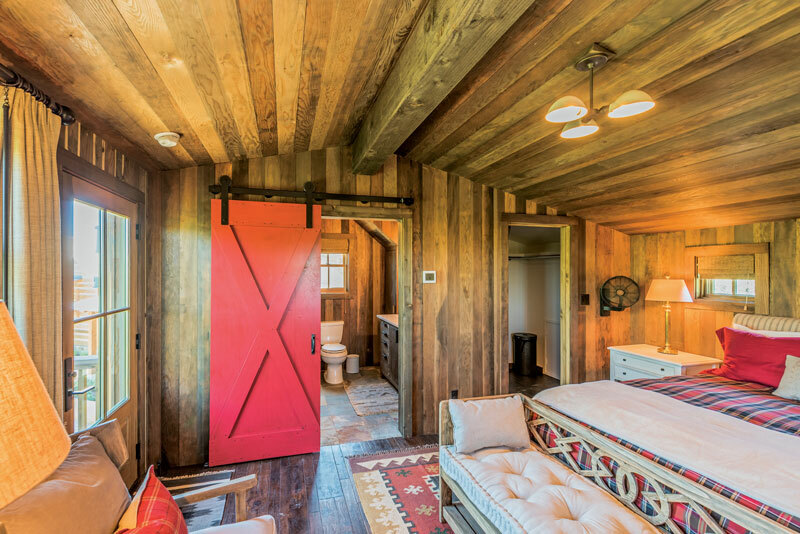 This quaint bedroom is located above the barn-style detached garage, hence the red-glazed sliding barn door leading to the bathroom. The builder used the leftover antique ceiling boards for the cabinetry and vanity in this space. 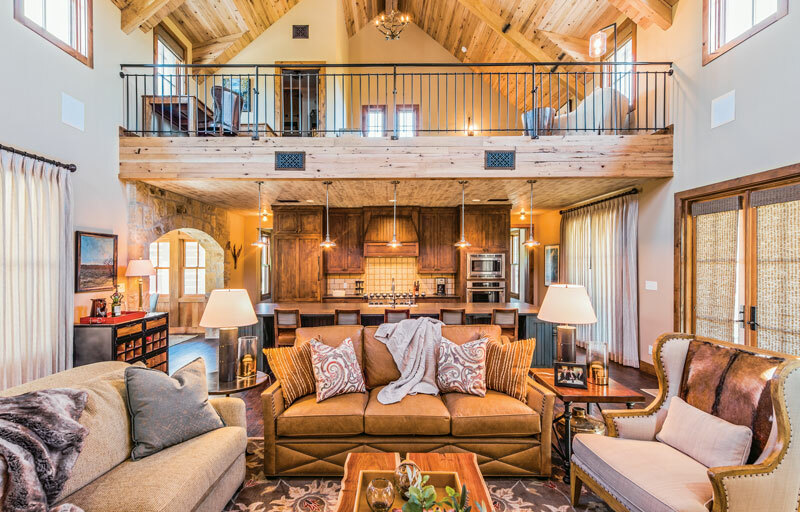 Like the areas in the main house, the guest cottage is half-log sided, with the exterior logs, trim, porches, soffit and purlins in a hewn and brushed texture by Hearthstone, Inc. The layout of each side of the duplex is a mirror image consisting of bedroom and en suite bath. Meals are taken in the main house. 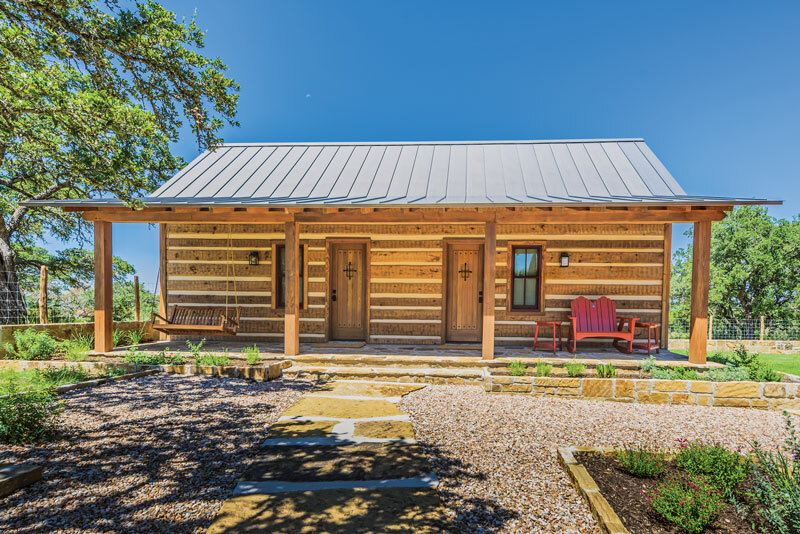 The outcome of this collaboration is The Overlook Cabin — a stunning hybrid homestead, combining logs, timbers and signature Oklahoma Blend stone. Featuring a mixed-materials main gathering house, a two-bedroom log guest cottage and a detached board-and-batten barn-style garage with a loft situated around a central courtyard, it certainly achieved the time-honored look the Wilsons were seeking. The guest cottage is a dual suite design measuring 16-by-30 feet plus bump out. The metal roof is standing seam, paint grip, according to the general contractor, Gabe Wilson of Centurion Custom Homes. The low shed roof over the porch protects the logs and guests from weather exposure and lends that Old-West homestead appeal. Each building meets at the central courtyard around a built-in stone fire pit, and together they create a comfortable family compound that will work for generations to come.